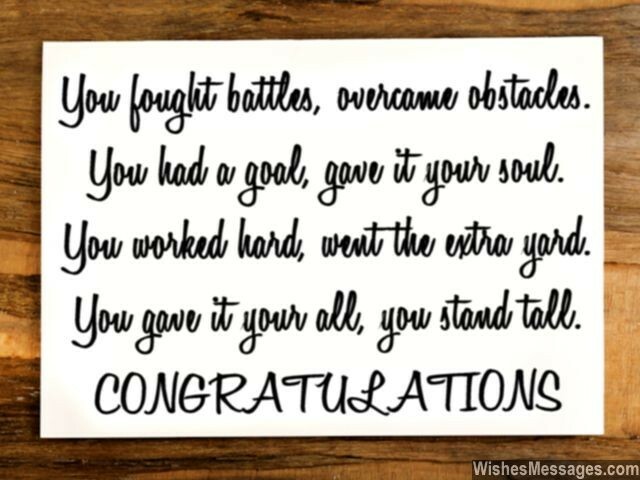 Graduation Messages and Quotes: Congratulatory notes for graduates are all about weaving inspirational words into quotes which motivate them to take life head on. Write something special on a greeting card for someone who has just graduated. If you’re going to give a speech, say something that embodies the spirit of being a fresh new graduate, ready to lock horns with destiny. Whether it is your son, daughter or friend – let your words make them realize the importance and power of education. Inspire them to use their college degrees to carve out brilliant careers for themselves. Play your part in making the world a better place, one inspired graduate at a time. 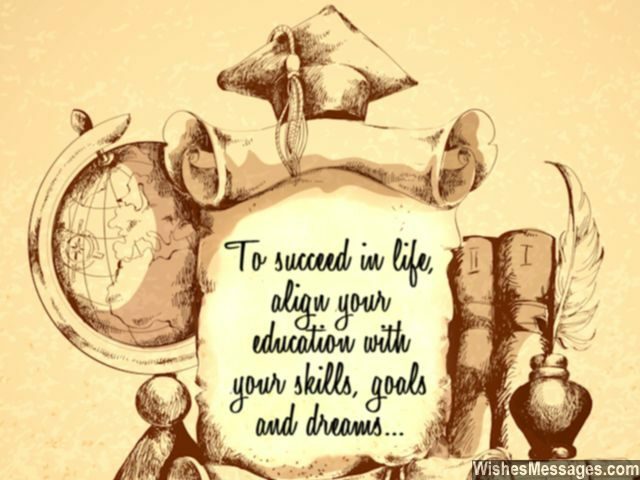 1) To succeed in life, align your education with your skills, goals and dreams. Good luck. 2) College opened your mind to a world of possibilities. Now open your mind to the impossible. Congratulations. 3) Life isn’t too different from college. You will make new friends and new enemies along the way. You will meet people who you fall in love with, and people you start to hate. There will be people who support you and people who will become the biggest naysayers. There will be victories, there will be defeats. Just keep going, work hard and aim to win. Congratulations for graduating. 4) Your career will take you through unknown twists and turns but it is your education which will be the pillar you can always lean on. Congratulations. 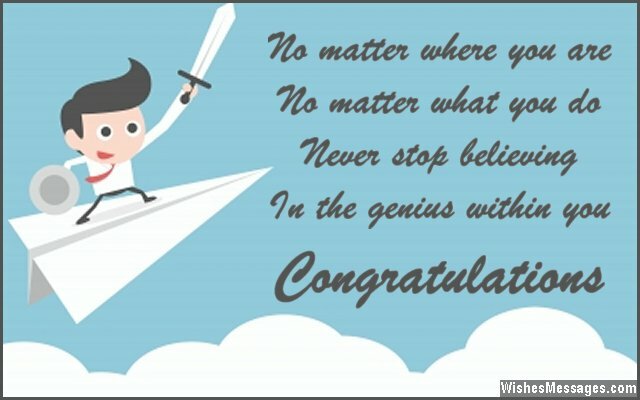 5) Congratulations – not just for graduating with a master’s degree, but for finally becoming the master of your own destiny. 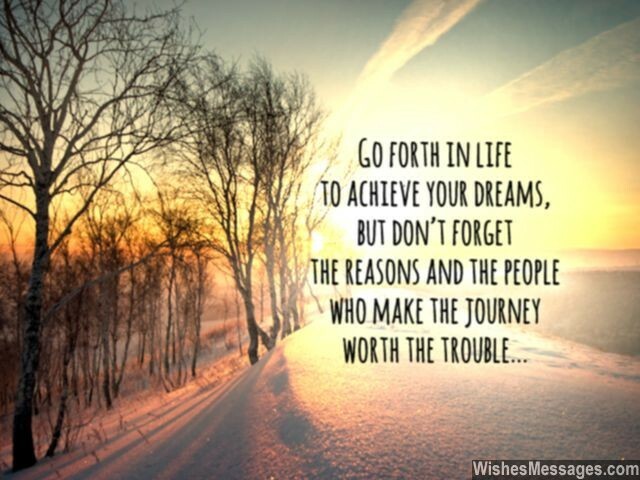 6) Go forth in life to achieve your dreams, but don’t forget the reasons and the people who make the journey worth the trouble. Congratulations. 7) Your degree is not just a piece of paper. It is the set of wings that will help you fly away and burst out of the horizon into a new world called YOUR LIFE. Congratulations. 8) You may have graduated today, but you were a winner in our eyes since the very beginning. Congratulations. 9) Nothing in life can take away the lessons you have learnt while walking along the road to success. Congratulations for graduating. 10) Nothing can prepare you for the real world, not even college – just like how nothing could prepare you for college, not even school. Congratulations. 11) You fought battles, overcame obstacles. You had a goal, gave it your soul. You worked hard, went the extra yard. You gave it your all, today you stand tall. Congratulations. 12) Your graduation marks the culmination of all the hard work you have put through your life as a student. Enjoy it, savor it and bask in the delight of achieving your goals. You have made us proud. Congratulations. 13) Your graduation marks the end of studying and the beginning of life’s real learning. Congratulations. 14) Education is about understanding the possibilities that the world has to offer. Being successful in life is about understanding the possibilities that you can create by yourself. Good luck. 15) Congratulations for graduating with flying colors. Now go out there and start minting those dollars. 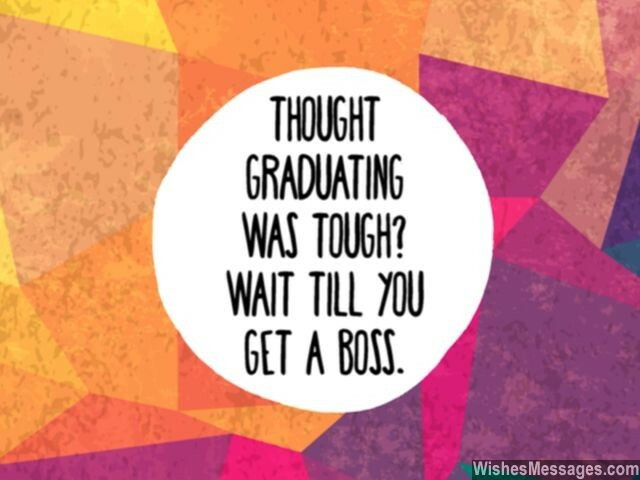 16) Thought graduating was tough? Wait till you get a boss. Congratulations. 17) We made sure that you went into a good college because we believed in you. But you graduated, because you believed in yourself. Congratulations. 18) Your graduation ceremony is a celebration of the fact that you are now ready to go out there and make the world a better place. Congratulations. 19) The power of education can’t be measured, unless you count its power to create a career, a life, provide for a family and most importantly – pave the way for a better tomorrow. Congratulations on getting yours. 20) Congratulations for graduating. Hereon, forward is the only way in life. All the best. 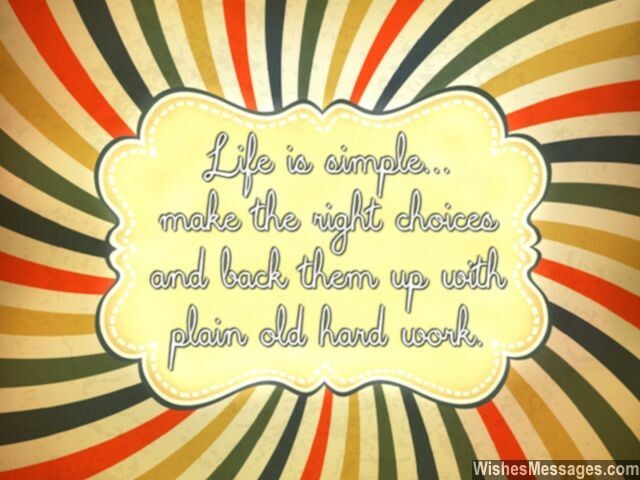 21) Life is simple – make the right choices and back them up with plain old hard work. Congratulations on graduating. 22) In your eyes you may be a graduate with a fancy degree from a fancy college but don’t forget that in our eyes you will always be the little boy who cried until he got his candy. Congratulations. 23) As a student, today is a proud moment for you to graduate. As your parents, today is a proud moment for us to see our son finally stand up on his own feet. Congratulations. 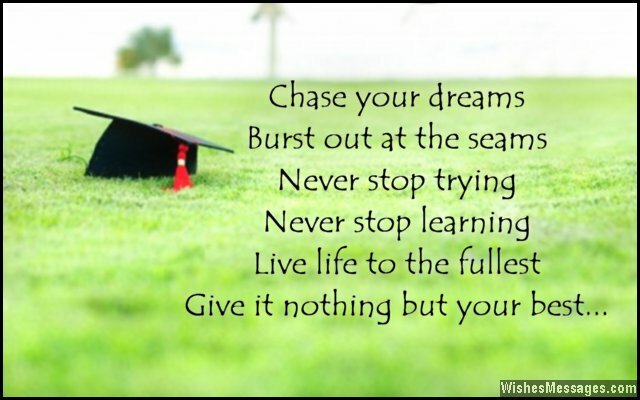 24) Now that you have graduated you can finally start EARNING but you will never stop LEARNING. Congratulations. 25) May your graduation be the beginning of many more wonderful achievements in your life. Congratulations. 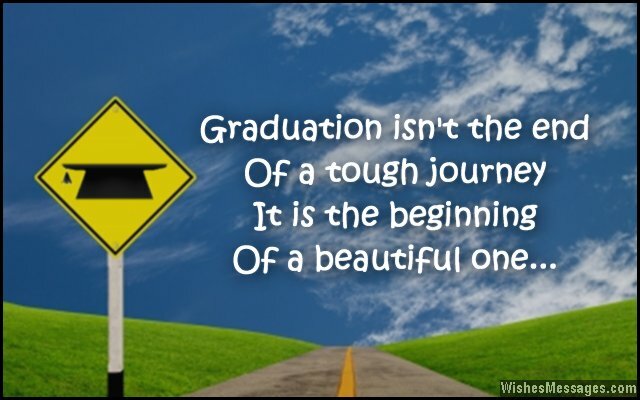 26) Graduation isn’t the end of a tough journey. It is the beginning of a beautiful one. Congratulations. 27) You studied hard in high school to get into a good college. You toiled through your semesters to come out as a fine young graduate, ready to take on the world. Let your life so far be an example, that hard work always pays. Congratulations. 28) On your graduation just remember one thing – always look back to your education, never your mistakes. Congratulations. 29) We hope that your graduation ceremony is awesome, and that it is the beginning of many good things to come. Congratulations. 30) May your graduation ceremony be the spark that lights up the fireworks of success and happiness in your life. Congratulations. 31) No matter where you are, no matter what you do, never stop believing in the genius within you. Congratulations on your graduation. 32) You’ve fought your battles well. Now it is time to rest and celebrate. But don’t take it too easy. You have to prepare to fight the biggest battle of them all – it’s called LIFE. Congratulations on graduating. 33) Congratulations on your graduation. You are almost there. Now all you have to do is go out there and show the world what you are made of. 34) People can rob you of your money but they can never rob you of your education. Congratulations for securing yours. 35) Your graduation ceremony is not the end of a long journey. It is the beginning of a longer one which will make college seem like a little speck in the bigger scheme of things life will offer. Congratulations. 36) Chase your dreams, burst out at the seams. Never stop trying, never stop learning. Live life to the fullest, give it nothing but your best. Congratulations. 37) Sorry to spoil your party but graduating from college is just the first among many other challenging steps you’re about to face in life. And the worst part is that, the rest of them won’t even be half the fun. Good luck. 38) Congratulations on graduating. You have just secured for yourself a better tomorrow, by being responsible and taking charge of your life today. 39) You may have graduated from college but you will never graduate from learning in life. Congratulations. 40) Your degree may get you a good job but only hard work will give you a good career. Good luck and congratulations.